A while back, when I was researching my book on online community, I came across a fascinating story. It’s one that is rich with lessons for content marketers and demonstrates why editorial content is just the tip of the iceberg if you’ve already built a following. When one blogger created a forum-based community for her readers, nearly 16,000 readers signed up for her community in the first day alone. That community still thrives nearly four years later. Blogger Heather Armstrong is no stranger to the power of community. She’s built a healthy following on Dooce.com, a website she started in 2001. A few years into her professional blogging career, she shifted some of her focus away from finding new readers. It was high time she invested in her existing audience. Heather and Ben realized that Dooce’s loyal readers were begging for a home. They came often to read comments and find out if new editorial content had been posted. They wanted to be a bigger part of the experience. They craved a share in the ownership, an insider’s identity. Up until that point, they’d simply been lurking, like vagrants searching for a place to stay. The community was alive. It demanded a voice. To maintain the integrity of the blog, Ben and Heather chose to build the community features around questions and answers. That way, Dooce members could initiate conversations, and other readers wandering the site aimlessly, looking for new content, could contribute answers. Whatever end of the discussion you landed on, the sensation of being an “insider” and a contributor to Dooce was present. A new tab labeled Community appeared on the top navigation, and the new features officially launched. Within the first day, nearly 16,000 loyal readers signed up for the Dooce community — an indicator that the community was already present, almost supernaturally, and was hungry for the interaction in which it could now engage. Dooce’s new forums did more than just establish a tighter-knit community. They also became a rich source of user-generated content. Done right, your community can both create rabid brand loyalists and become a free source of new content. All you need is the right approach. Here are four tips for adding a community to your existing website. 1. Listen to the data: Your data will tell you whether or not you’re ready for a community. That’s how Dooce predicted success before it undertook its project. Repeat visitors: What percent of visitors have visited your site in the recent past? Dooce saw that a quarter of its traffic represented repeat visitors — a compelling reason to give them more to do when they visit. Number of visits: When you’ve isolated your repeat visitors, build an even more persuasive business case by measuring how many times loyal readers visit over a defined period of time. Reach out directly to loyal visitors you’ve already identified to find out if they’d participate in a more concrete community. 2. Stay consistent with your brand: You understand the importance of staying consistent with your brand in all that you do. But it bears repeating here. Dooce implemented its Q&A format with its audience in mind. The Dooce community became a huge success as a result. Reach out to audience members to find out where they interact most often on the web. (LinkedIn? Twitter? A niche community site like American Express OPEN Forum?) Find out what they like and dislike about its format. Create something better than what they already use and your audience will flock to it. 3. Add only what begs adding: Inspiring community interaction requires a neat and simple approach. If adding a bunch of new features seems overwhelming for you, it’s probably overwhelming for your visitors, too. 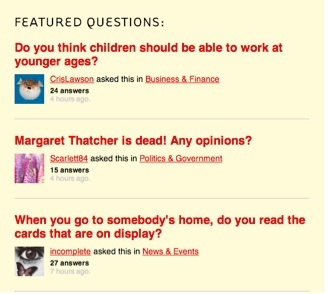 Dooce only added a forum with a Q&A format, demonstrating a clear purpose for interaction. That way, it was simpler to direct engagement without telling the audience how to use it. The Dooce Q&A format is easy to use, easy to digest, and easy to react to. The simplicity of the forum begs for user interaction and contribution. You can shout at your audience about how to use your community features until your lungs give out. But in the end, you’ll only end up insulting and alienating them. By keeping your interaction features simple, you can show your readers how they should use them. 4. Separate community features from editorial content: As Ben Brown mentioned, Dooce built a sustainable, rabid readership on editorial content. Chances are, that’s how you’ve built yours, too. A community is not meant to replace that. Therefore, it’s important to keep a wall between your editorial content and your community interaction features. The Dooce community exists on a different page than the editorial blog, making the community user-friendly and focused. In the beginning, you don’t want to distract your audience from the content they came to your site to consume in the first place. Your community may surpass your editorial content down the road. But for now, stick with what your audience knows and loves and make community features an added value. 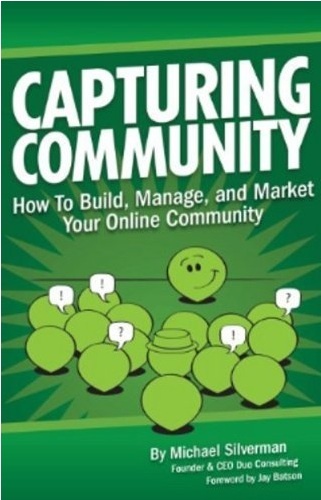 Get more practical advice on creating content that can be used to build engaged communities in Michael’s book, “Capturing Community: How to Build, Manage and Market Your Online Community.” And to celebrate the one-year anniversary of the book’s release, you can download a free Kindle version on Amazon through April 19th, 2013.